Rebecca Evans has been an avid animal lover her whole life. She grew up with horses, dogs, cats, rabbits,and birds as pets. She has worked as a middle school science teacher, but has pursued her passion for art by drawing animals. While studying art history during her school years, J.W. Turner and the Impressionists made a lasting impression upon her. She honed her skills by taking studio art classes while a student at Oxford, England and while attending Skidmore College, Saratoga Springs, NY. 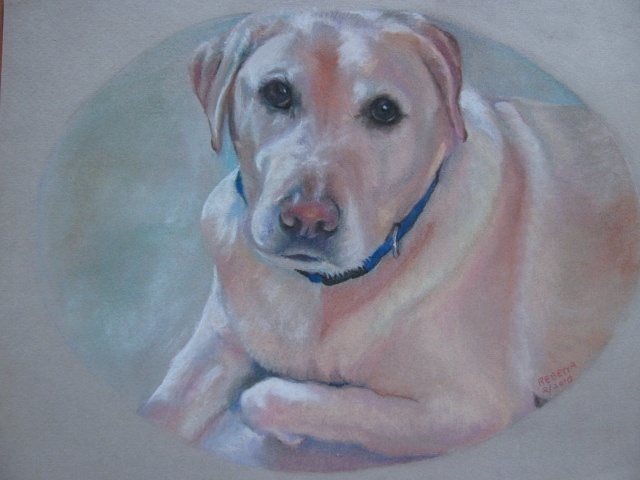 Now after thirty years of drawing as a hobby she focuses her time and talents into developing a portfolio of pet portraits. Rebecca's artwork was displayed at the jurored 2010, 2011 and 2012 Bryn Du Art Shows. Each animal emits its own unique energy. Photography is able to capture at the click of the shutter the pet's look and expression at a fleeting moment in time. During that frozen time,the eyes and luster of the animal's fur reflects the softnees or brightness of the ambient light and the mood. I use a photograph and transform that captured and often treasured memory of the moment through the use of soft pastels. I select soft pastels because of their ability to reproduce the soft texture of the fur, blending of the sublties of colors inherent in nature. Each animal has a particular look, or expression or trait fully appreciated by its owner. I strive to make the portraits of the pets have depth, personality and the animal's soul conveyed to the viewer.